Stuffed steak. Need I say more…? Yes? 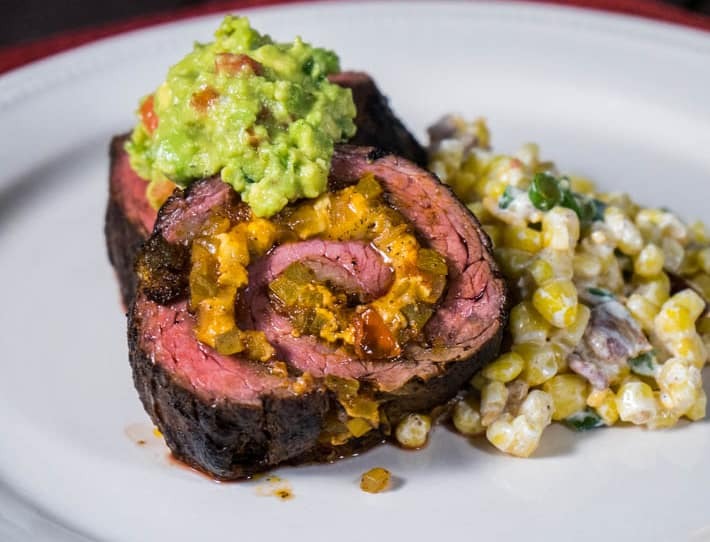 Ok. Mexican Stuffed Skirt Steak. Are you drooling now? I’ve mentioned before that Cody and I love Mexican flavors. We will Mexican-ify everything if we can. When I realized that we have, count them, zero beef recipes on the blog, I had a mini heart attack (a non beef induced heart attack, obviously). It’s slightly confusing to me, because I love beef. I brought this crazy fact to Cody’s attention, so we came up with this powerhouse of flavor. We’ve also come to the conclusion that Chirpy’s been a bit one dimensional with flavors so far – but what’s good is good, right? A super flavorful steak. Tomato, onion and bell peppers with a limey kick. Cheeese. I dare you to find fault in that. A quick sear on the outside on a hot pan gives some glorious color. It is then popped in the oven at 350º for 45 minutes. After 45 minutes, you are left with a perfect medium steak. It’s almost too perfect to eat. No, really. It’s so perfect, you’ll want to keep it all for yourself. Sorry family. I spend too many minutes admiring this wonderful piece of art/steak. Sauté the onion, peppers and tomato with the lime juice until soft. Mix all the spices for the spice rub and rub both sides of the skirt steak. Spread the onion, pepper and tomato mixture on top of the steak and roll tightly. Sear each side of the steak on a hot pan to seal the seam and get a crisp, colored outside. Pop in the oven for 45 minutes to get a perfect medium steak. Rest it for at least 5 minutes and then slice into 1 inch wheels and serve immediately. 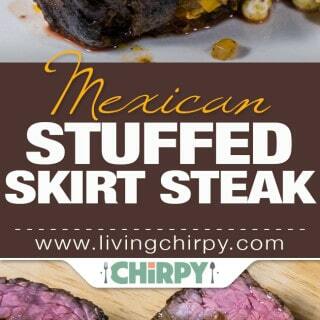 Mexican Stuffed Skirt Steak – Pin it!